Pictures not exactly to scale. 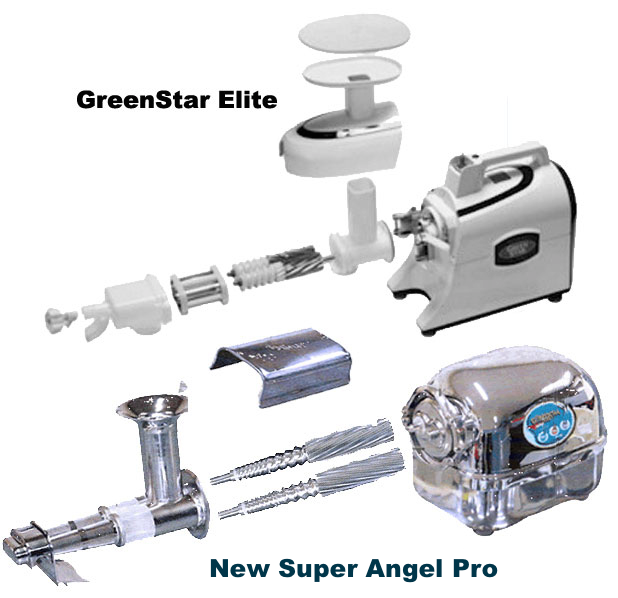 The GreenStar Elite and Super Angel are the two best twin-gear masticating juicers in the world! You would be in juicing heaven with either of them! However, one is more than twice as expensive as the other – so what is the difference and how do you choose? The answer depends on your needs, your motivation and your budget. The first thing to remember is that if juicing is a hassle you probably won’t do it – at least not as often as you would like. So ease of use is and cleaning are most important. The easier a juicer is to use and clean the more often you will want to use it. In my experience, the GreenStar Elite is much easier to use and clean than any other twin-gear juicer … except the Super Angel. The very first time you use the Super Angel you’ll be impressed with how easy and efficient it is. The quality and durability of the stainless construction are also immediately apparent. The innovative snap-down front clamp and simple three-step assembly make it the most user friendly twin-gear juicer around. The new Green Star Elite clamping system is a huge improvement over the old screw-on contraption though not quite as easy as the one-piece design of the Super Angel. For serious juice lovers that may be worth the extra cost for the Super Angel . The Super Angel is superbly cast of solid stainless steel, and the front housing, including the all-purpose screen, is one piece of stainless steel. The GreenStar Elite has 5 plastic parts to accomplish the same functions, plus different screens for fruits or veggies as well as an optional adjustment knob recommended for fruits. Except for the rear of the twin gears, most of the GreenStar juicer is plastic. So the simpler, one-piece design of the Super Angel cleans up more quickly and easily, and never stains. Stainless steel of course is a requirement in most commercial kitchens for the same reasons – easy to keep clean, durable and more hygienic than plastic appliances. Also, with the Super Angel you don’t have to stop juicing to change screens for different types of food. One brilliantly designed, exclusive three stage screen handles most your needs from fruits and vegetables to leafy greens and wheatgrass, though a specialized fruit attachment is available if you really do a lot of fruit, which isn’t recommended for your health anyway since there is far too much sugar in fruits for most people. This also means that it doesn’t need a front adjustment knob. I almost never switch between fruits, veggies and pasta at the same session, so changing juicing screens occasionally isn’t a problem for me. The new 3-Stage Jumbo Gears of the GreenStar Elite are a huge improvement over earlier GreenStar juicers. However, they are a combination of stainless steel and plastic. The unique 3-stage Super Angel twin gears are actually noticeably bigger and longer, and are made of solid stainless steel (the difference is less than in the picture above, which isn’t to scale). The superb design of the Super Angel housing and gears combine to make this the most efficient juicer available, actually producing as much as 20% more juice than the Green Star Elite in my experience — with less foam, too! On the other hand, the GreenStar Elite is the most efficient juicer under $1,300 – and costs less than half as much! If you juice a lot then 20% more juice means the new Super Angel could pay for itself relatively quickly. However, not everyone can afford the price difference, and the GreenStar Elite is an exceptional juicer for $549.95 that won’t disappoint! Both masticating juicers are multipurpose appliances that can be used to make many other delicious recipes, including Nut Milk, Raw Ice Cream, Fruit Sorbet, Baby Food and Nut butters. The motor on the Super Angel is one the slowest low-speed motors available at 82 RPM’s, which means less heat and oxidation. The GreenStar Elite runs at about 110 RPM. Not much difference, but that could be important to somebody since it means slightly more pressure and heat in the juicing chamber, which theoretically can reduce the enzyme activity in your juice. From a raw foodists perspective, most of the enzymes in fresh juice are still live and no cooking has taken place – so virtually all the nutrition you are looking for in raw, fresh juice is still there. Other nutritional factors, like Juice Stability (lack of oxygen and heat) are relatively comparable – juice made in both juicers is very stable and will last in a fridge for up to 72 hours. Other things like weight, dimensions, controls, counter space, containers (Angel provides a stainless steel juice container), etc. are roughly comparable and not deciding factors. Both juicers are SLOW masticating juicers that you need to feed more slowly and in smaller pieces than you do with a typical high speed centrifugal juicer. All masticating juicers, in fact, take a little more commitment and work to use than centrifugal juicers. But centrifugal juicers (Jack LaLane, Breville, Juiceman, etc.) all fling juice through the air to separate it from the pulp at high speed, maximizing oxidation and heat, thus significantly degrading juice quality. Remember — any fresh juice you make yourself is better than no juice at all. In the end you have to decide how important these differences are. If you have a serious health challenge, you may be more motivated than someone who just wants to lose weight or get a little healthier. However, you really can’t go wrong with either. Please call or email me if you have any other questions about juicing and the raw food lifestyle! Remember, during my Unadvertised Special you save $30 with Coupon Code WORLDS-BEST right now on the latest Angel Models! Decline of the GMO Gangsters: Down But Far from Out!